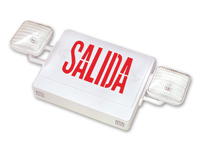 This SALIDA Combo Lamp Head and Exit Signs meet code and make a difference. Energy-saving, LED lighted Exit signs feature two bright side lamps for incredible visibility. • Damp location rated Exit Signs provide extra illumination in a blackout situation. • A Universal Canopy is included for versatile installation options. • This combo Exit sign includes universal knock-out chevrons and a SALIDA faceplate. • Dimensions include emergency lighting lamps. Size : 13.5" x 30" x 6"